Q&amp;A: What is the future of fatherhood? The psychologist Adam Grant is interviewed on how gender roles are changing at work and at home. Gender parity is one of the key challenges on the agenda for Davos 2015. One of your interests, as an organizational psychologist, is gender balance in the workplace. How does it relate to gender balance in the family? Not necessarily in the ways you might think. Let’s say you want to encourage more girls to aspire to roles in traditionally male-dominated fields like software or engineering. How would you do it? Maybe you’d point to the importance of school, or female role models, or parents explicitly encouraging their daughters to broaden the choice of careers they consider. None of those things can hurt, but recent research shows there’s also a big effect from something less expected: how men and women divide domestic chores. It turns out that girls who grow up seeing mum and dad sharing housework and childcare duties are more likely to work in non-stereotypically female careers. What factors influence how likely parents are to nurture gender equality at home? It’s an interplay between wider culture and personal experience. If you grew up in a house where dad earned all the money and did none of the chores, you’ll have to make the conscious choice to overcome that in your own parenting style. The same applies if you live in a culture where there are traditional hierarchies with strongly defined gender roles. The positive flipside is that once these things start to change, personal and social experiences start to reinforce each other. If you model an equal division of chores for your children, they’ll grow up taking that for granted, especially if it’s a message reinforced by wider social norms. Is there a role for public policy in helping this virtuous circle along? Paternity leave is an obvious policy choice here, and one of the areas in which the rest of the world could take a lead from Scandinavia – it sends a powerful message about the value of the role of husband and father. More broadly, we should consider policies that encourage firms to impose limits on the hours people work. When there’s pressure to be in the office 70, 80, 90 hours a week, it becomes impossible to segment time for non-work responsibilities. How can employers encourage their male employees to take paternity leave, and generally be more engaged as husbands and fathers? That’s a question that needs more study, and obviously it’s easier to pull off in companies that are serious about creating a broader culture of valuing their employees – some of the leading names in Silicon Valley come to mind here – rather than simply sucking them dry. One great initiative that’s becoming more common is a “bring your daughter to work” day. LinkedIn recently did an interesting variant on that – a “bring in your parents” day. Through school and college there are constant opportunities for parents to take pride in what their kids are doing, but that basically stops with your last graduation ceremony. Why shouldn’t you encourage your parents to celebrate your achievements in the workplace, too? The deeper motivation here is that it makes you connect your working life to your family life. Is this the kind of workplace I’m proud to show off to my parents? What about my own kids – would I want them to work here? If not, what would I change? It’s an opportunity to examine the norms of the present workplace and think about what a more evolved society would look like. Ultimately, though, it’s a question of leaders setting an example. 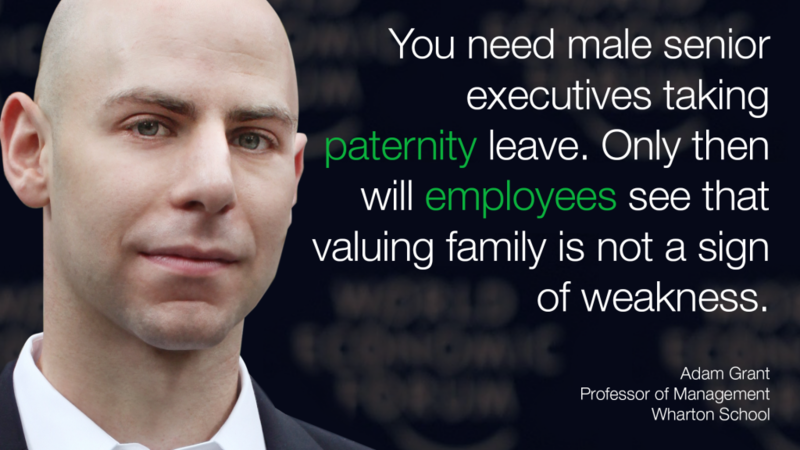 You need male senior executives taking paternity leave, and showing that they see themselves first and foremost as a father and a husband. Only then can we expect employees to look up the hierarchy and perceive that valuing family is not a sign of weakness that will detract from their career. Does having a family, in fact, typically tend to alter men’s views on gender in the workplace? Yes, but only if they have a daughter – there are studies showing that men who have daughters are more likely to support equality in the workplace. It’s counterintuitive that the arrival of a daughter would have more of an effect than growing up with a mother or sisters, but the evidence seems robust. The explanation may simply be that having a daughter gives men who are anyway sympathetic to gender issues the cover to speak up. They may feel unwilling to take a stand on making their work environment more female-friendly, but being able to say “when I think about my daughter…” makes it feel like this reinforces rather than compromises their sense of masculinity. That’s something we should welcome and work with, and “bring your daughter to work” days are a way to catalyse it. There’s a growing body of evidence that organizations with lots of traditionally non-female roles can’t change overnight – they do need a transitional period in which men act as sponsors for women. And note I said sponsors, not only mentors; often what women need to progress in a male-dominated environment is someone encouraging them to apply for promotions, insisting that every vacancy has a diverse range of candidates assessed, and so forth. Is that something you see increasingly happening among male executives? I’d love to see data on this, but just from conversations, I get a strong sense that there is much more awareness about how pervasive gender biases are and how important it is to break them down. Sheryl Sandberg has had a huge impact with Lean In, and my guess is that it the situation will improve in the coming years, if in part only because organisations will find it increasingly difficult to thrive if they’re missing out on female talent. Adam Grant is a Professor of Management at Wharton. He is the author of Give and Take, a New York Times bestselling book. Interview by Andrew Wright for the World Economic Forum.